Thought leadership is a form of influence and marketing. In today's growth-hacking startup culture, thought leaders are more respected and recognized than ever before. Entrepreneurs are movers, shakers, innovators, disrupters and creators. They don't follow the beaten path; they blaze their own trail. With this kind of chutzpah, entrepreneurs possess the character and persona to become thought leaders -- good ones. Here's what entrepreneurs need to know before assuming the mantle of "thought leader." These are the nine things that true thought leaders always do. Ah, the blog. As an inveterate decade-long blogger, I have a hard time not singing the praises and virtues of blogging. It's been my method for building business, spreading the word, and, I hope, becoming a force for good. I know of very few thought leaders who do not actively maintain a blog. There are some very influential entrepreneurs without one. In spite of their leadership, however, they don't necessarily purport to be thought leaders. A true thought leader must have a platform for broadcasting those thoughts. The best platform for that purpose is a blog. If you aspire to thought leadership, I recommend as a first step that you secure your spot on the web -- yourname.com is best, but you can go for a variation of your name if you have a common name (Example: DaveSmithTheActor.com). One of the simplest online publishing tools to use is WordPress. One of the terms for "thought leaders" is "opinion leadership." Thoughts and opinions go hand-in-hand. This means that you must voice your opinions. Second, that your thoughts should influence others' opinions on a given topic. Being opinionated is often seen as the domain of rude or arrogant people. In reality, it is possible to be kind, generous and gentle, and still hold very strong opinions. One of the reasons why thought leaders are so well known is because they say things that are jaw-droppingly true, strikingly clear, and oh-so quotable. 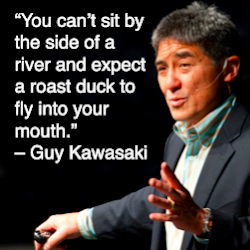 "You can't sit by the side of a river and expect a roast duck to fly into your mouth." "Great companies start because the founders want to change the world...not make a fast buck." Such powerful and pithy quotations are powerful tools for spreading thought better and faster than you thought possible. One does not become a thought leader out of nowhere. Such leadership must grow from the soil of hard work, true experience and moderate success. You don't have to found Google or publish a bestseller in order to join the ranks of thought leaders, but you do have to have some respect. Where does such respect come from? It comes from doing the very thing for which you want to be a thought leader. For example, if you want to be a thought leader among social-media entrepreneurs, then you should have some experience starting a social-media company. The moment you step onto the pedestal, people will start examining the base of the pedestal, asking, "How did you get there? What are your qualifications?" Make sure that they see something true, worthy and respectable. The best thought leaders are well known for their excellent performance at big venues and other major industry events. Such speaking events are invitation-only, but you can start small. Less popular speaking events are accessible to entry-level thought leaders. Local meetups, community colleges, and Google+ hangouts are excellent places to sharpen your speaking ability and build your speaker's portfolio. Thought leaders understand the value of personal branding. For them, they engage in personal branding for a specific purpose -- not just to get an narcissistic kick out of life. Their purpose is streamlined and intentional. Thought leaders use their personal branding to build entire businesses from scratch. A personal brand becomes more important than just a personal platform. It is a position of influence in order to back up their position of thought leadership. Second, they engage in personal branding like it matters. True personal branding requires significant amounts of time and effort. It's not some haphazard, second-thought, tweet-if-you-have-time approach. Personal branding takes the same amount of time, cost and effort as it does to brand a business. And it's just as important. It's hard to say whether having powerful friends makes thought leaders, or is an effect of being a thought leader. Chances are it's both. Make friends with people who will help you to become a better person. But don't just leech off them. Give to them. Friendship is a two-way street, and you have to do your part to prove that such a relationship is beneficial. "Strategy" is a word that's often bandied about, but seldom truly understood, especially when it applies to thought leadership. Many people want to be a thought leader, but do not understand its significance -- what it requires of them, and what leadership in their context truly means. In order to be effective as a strategy, thought leaders must be intentional about why they are engaging in thought leadership. The answer to the why will influence the practice of the how. Thought leaders need to keep a pulse on the culture generally, and the tenor of their niche particularly. A thought leader, for example, is going to know what #thedress is all about, and will probably even toss in a tweet or two for good measure. Beyond the cultural flash-in-the-pan, however, a thought leader understands how to leverage the technology of social media to enhance her thought leadership influence. Twitter, LinkedIn, Facebook, Pinterest, Google+ -- all of these can push the thoughts of a thought leader farther, as long as she knows how to use them effectively. In this article, I've focused on the characteristics of thought leaders that help to build and establish a brand and reputation. In so doing, I've left out a crucial component. Now is the time where I want to insist on a final trait that you will observe in every respected thought leader. Thought leaderships are generous and giving people. They are generous with their time, their talents, their money and their advice. I've learned that there's no such thing as a respected leader who is rude and stingy. Leaders give intentionally and strategically, making sure that their generosity does not compromise their integrity nor denigrate the recipient. If you aren't yet generous, that probably needs to change before you can gain the respect of others. What trait have you observed in thought leaders?